Class for collision engine based on the spatial subdivision method. Contains both the broadphase and the narrow phase methods. Mark bodies whose AABB is contained within the specified box. Return the pairs of IDs for overlapping contact shapes. Clears all data instanced by this algorithm if any (like persistent contact manifolds). Get the dimensions of the "active" box. The return value indicates whether or not the active box feature is enabled. Perform a ray-hit test with all collision models. 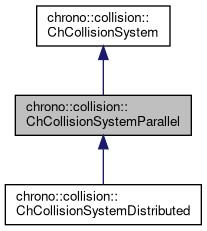 For instance ChSystem, after each Run() collision detection, calls this method multiple times for all contact containers in the system, The basic behavior of the implementation is the following: collision system will call in sequence the functions BeginAddContact(), AddContact() (x n times), EndAddContact() of the contact container. But if a special container (say, GPU enabled) is passed, a more rapid buffer copy might be performed). For instance ChSystem, after each Run() collision detection, calls this method multiple times for all proximity containers in the system, The basic behavior of the implementation is the following: collision system will call in sequence the functions BeginAddProximities(), AddProximity() (x n times), EndAddProximities() of the proximity container. But if a special container (say, GPU enabled) is passed, a more rapid buffer copy might be performed). Run the algorithm and finds all the contacts. (Contacts will be managed by the Bullet persistent contact cache). Set and enable "active" box. Bodies outside this AABB are deactivated.